This is a great project for anyone who wants to remember that great vacation in art or if you just want wish flowers of areas you want to visit. 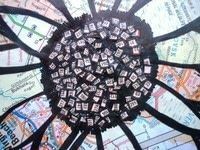 The maps, alas paper and frames are all recycled. I make sure my frames are ready to go before I start anything else. 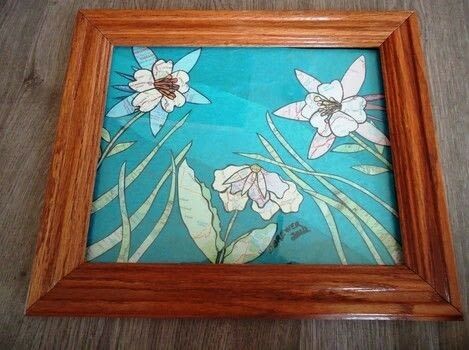 I normally have many random paints ready to go.First I take the frame apart, if it is a complete frame great, if not I find a small piece of heavier cardboard to fit the back of the frame and use my husbands old guitar strings for wire hangers. I like to use cereal boxes for my art surface. I find they are the perfect thickness for these pieces. In this one the background is tissue paper that came in a gift box glued onto a cereal box first. 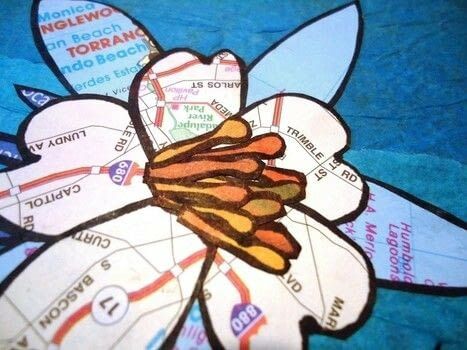 Use the sharpie and draw your flower on the map or atlas paper you are using, leaves flowers and all. You can leave space between your areas and have one great look or just layer pieces for another. Now cut out all the pieces. I used both scissors and a craft knife on a mat. If you cut to close to your black line, just draw it back on with your sharpie. Now just glue the pieces on your card board and put your frame back together. 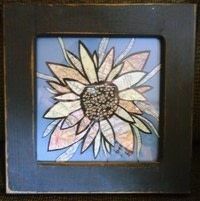 This was a cute little wooden frame that screamed yellow flower to me. The background on this one is some old blue folder we had. 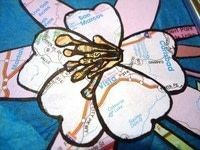 If you look closely the center of the flower is the distance markers from the map. Cutting them out was fun, since they are very tiny but I think it was worth it.